Sandy Smith cradles an urn containing the remains of her dog Bobo, who passed away in 2017. A growing number of pet owners are choosing to have them cremated so they can forever remain with them. Photo by Myron Madden /Times Free Press. 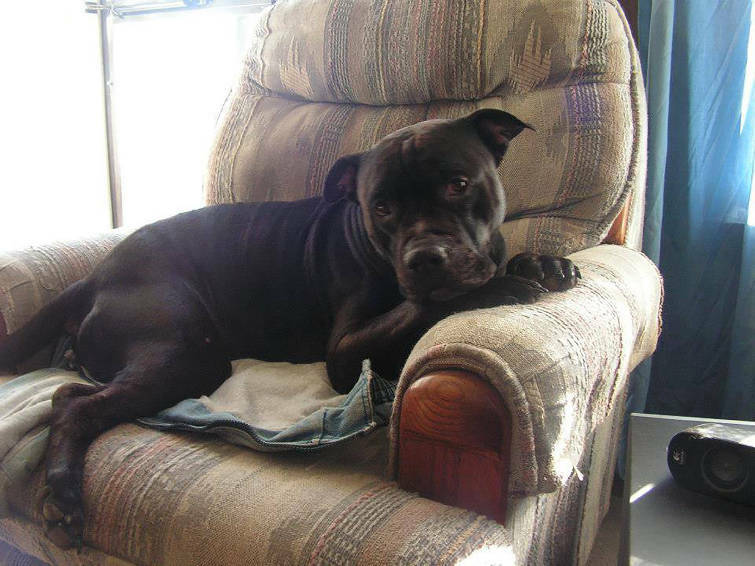 Bobo snuggles solo on an armchair - one of the only times he wasn't dutifully at owner Sandy Smith's side. Sammy and Sandy Smith had never intended to keep Bobo. Yet somehow the kooky pup managed to wriggle his way into their hearts. Born to their pit bull "Dammit" 10 years ago, the runt was an unusual little rascal with one comically bizarre feature: his giant head. The pup's noggin was so heavy that when he gathered around the feeding bowl with the other puppies and bent down to eat, his torso would tilt up off the ground and he'd flop over. "He was so ugly that you had to love him," Sandy remembers with a smile. Unfortunately, no one else seemed to see the charm hidden behind Bobo's big, floppy ears and the excess skin drooping off his muzzle. The facial features left him overlooked time and time again as, one after the other, his more adorable brothers and sisters found their forever homes. By the time someone did express interest in adopting the remaining puppy, the Smiths couldn't bear to give the little goofball up. So Bobo joined the family. And as he grew into his abnormally large head, he also became Sandy's shadow. When she rolled over in bed every morning, Bobo was sprawled out next to her. When she got out of the shower, she had to step over him. If she was cooking or washing dishes, he set up camp at her heels. In time, Sandy even forgot how to sit back on the couch because Bobo was always nuzzled in the space behind her. Almost every day for a decade and four months, the dog was by her side. So when a hip injury cut Bobo's time short and it was time to say goodbye last year, Sandy couldn't bear the thought of burying her best friend out in the cold, where he'd be completely alone. Instead, she chose to have Bobo's remains cremated. 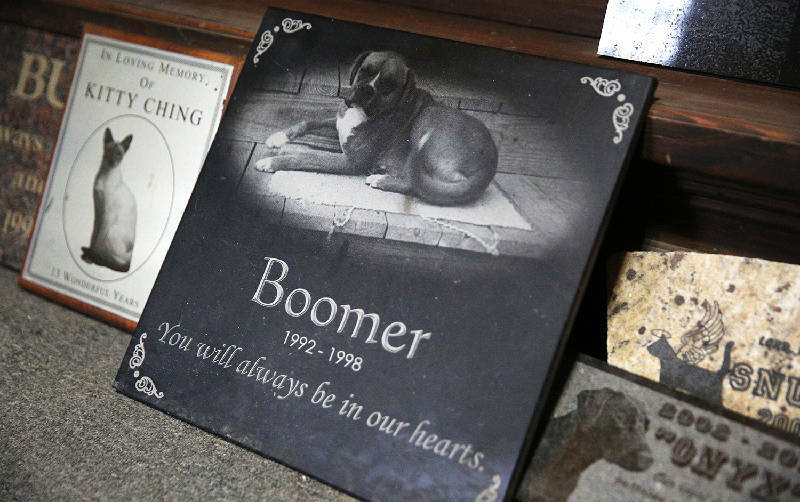 Now, the dog sits on a cabinet in the Smiths' Red Bank home in a rectangular tin urn decorated with paw prints, his blue collar wrapped tightly around its frame. It's a kooky urn for a kooky dog, Sandy says. And though Bobo is no longer at her heels or by her side, it ensures that he is never far from her heart. "I'm not worried about what's happening to him. I know where he is," she says, clutching the urn closer to her chest as tears well in her eyes. "He's with me." Jessica Stiner holds a clay imprint that was created for one of her customers at Pet Haven Cemetery and Crematorium. 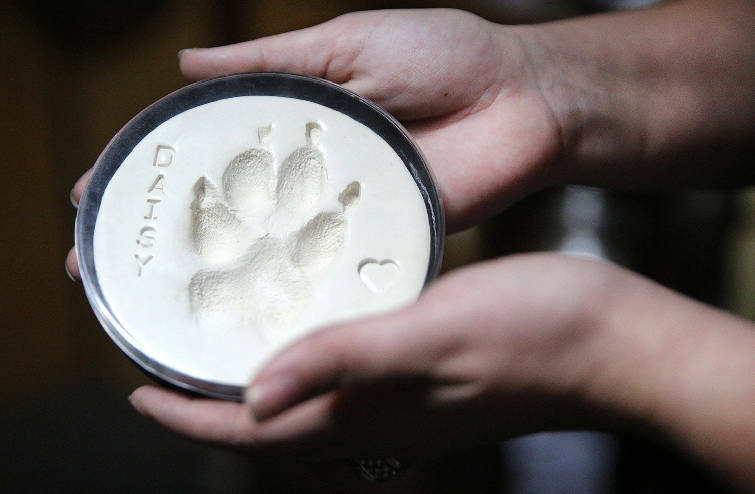 Customers have the option to get clay imprints and ink prints of their pet's foot when they take their animal to be cremated. Gone are the days of backyard burials and shipping pets off to "the farm upstate." After every dog has had his day and each cat has surpassed its nine lives, more and more people are choosing to have their late pets cremated. The Cremation Association of North America reports that pet cremation and memorialization is one of the fastest-growing death care markets in the United States and Canada. A survey by the National Funeral Directors Association in 2015 found that 17 percent of funeral home operators nationwide offered pet cremation, while another 11.4 percent planned to do so within a few years — and that did not include pet cemeteries. These days, even Wal-Mart offers urns for four-legged friends who have passed on. 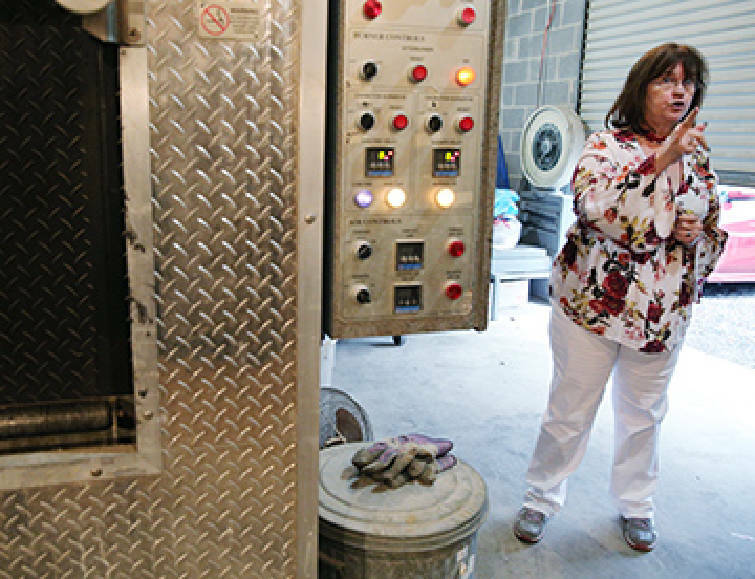 Pet Haven Cemetery owner Brenda Stiner talks about the cremation process. Brenda Stiner opened Pet Haven Cemetery and Crematorium on Standifer Gap Road in 1982. 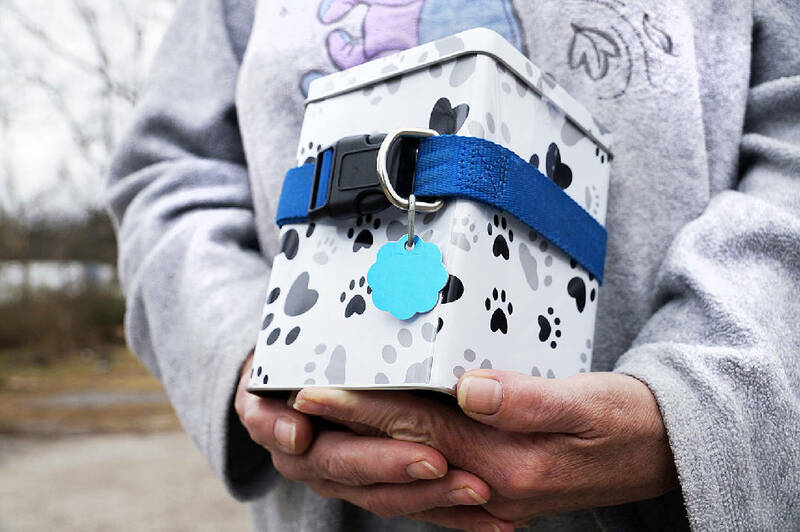 In the beginning, she had three or four pet owners coming in to cremate their pets a week, she says, while the rest opted to purchase a casket and headstone to lay their furry friends to rest in one of the funeral home's plots. But just as with human funerals, that trend is reversing. The National Funeral Directors Association expects cremation to beat out burial in 78.3 percent of deaths by 2035, and Brenda says she sees as many as 20 pet owners requesting a cremation in one day. The demand is so great that she is beginning to slowly phase out the burial service. One of the reasons pet owners are gravitating toward cremation is because they don't want to abandon their pets due to their living situation, says Brenda's daughter-in-law, Jessica Stiner, who is being primed to take over the funeral home. Some of Pet Haven's clients live in apartment complexes with no access to a backyard, Jessica points out. Others are worried about what might happen to their companion's resting place should they decide to move. "They don't want to leave their baby behind," Jessica explains. "They don't want them staying somewhere they're not going to be anymore." For Sonya Smith, who grew up burying critters on a farm, the decision to cremate her dogs Abby and Kiara came because the possibility of their resting place being disturbed only added to her grief. "This is a whole lot better to me than if I walk out and realize that the coyotes have just dug up my dog," Sonya says. "Because that would be really heart-breaking." Abby and Kiara had been by Sonya's side since she first moved out on her own at age 19, and over the course of 16 years, they had become more than just company. "Most of the people I grew up with have actual children," Sonya says, "but these were my children." Teresa Hicks shows the urn where she keeps her cat Chibi's ashes. 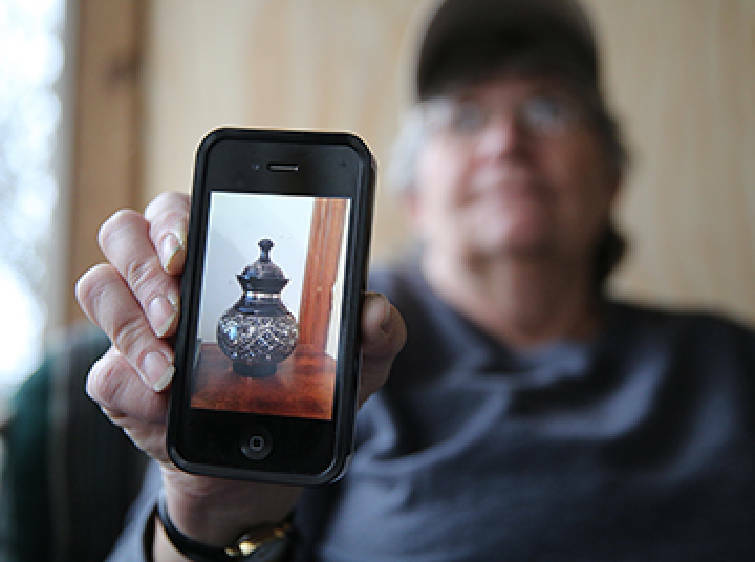 Hicks said she put the urn in a windowsill, since her cat enjoyed sun-bathing by the window. Few understand quite like Teresa Hicks, who plans to be buried with her long-haired black cat, Chibi. The 14-year-old cat, who passed away in September, was not the first feline companion Hicks has had cremated, but she was certainly the most special. Left behind by Hicks' son when he moved to St. Elmo, Chibi had become Hicks' "grandkitty," and the woman spoiled her just as much as she would her own grandchild. "She was my precious baby girl," says Hicks. "That's what I would tell her." Today, Chibi sits in a glossy, black urn on Hicks' windowsill, alongside the two cat-shaped urns that hold the remains of her Siamese predecessors, Jazmine and Sassy. When Hicks breathes her last breath, however, only Chibi's urn will follow her into the grave. "Chibi's just always been special, and no one would take care of the ashes and urn, and you never know when you pass on what's going to happen," she says. "Yeah, I know I'm crazy," Hicks adds with a laugh. One reason cremation is gaining popularity is its low cost in comparison to burial. $7,360: Median cost for human funeral with viewing and burial in 2017, according to the National Funeral Directors Association. The unconditional love between a pet and its owner is a bond that transcends even death. Jessica says several clients who visit Pet Haven for cremations hope to have their pets by their side when they're laid to rest, and many others bring in pets who died just days after their owner passed away. "We have a lot of clients come in because a loved one passed away and the pet doesn't last much longer than their owner does because they get heartbroken," Jessica says. "Pets get attached to their owners just like we get attached to our pets." Pet headstones on display at Pet Haven Cemetery and Crematorium. Though pet funeral homes seek to simplify the process for those left behind, saying goodbye is never an easy thing to do. Every day, Brenda and Jessica see pet parents breaking down or fighting back tears as they hoist their lifeless pals through Pet Haven's doors. Over the years, the women have seen widows walk in distraught, feeling as if they'd lost the only family they had left in the world. They've seen tall, burly men lumber in, shedding their stoic composure as the tears began to flow. They've even seen children shuffle in confused, asking "Why is my kitty gone?" or "Why is my puppy gone?" "All you can do is give them a hug and tell them it's going to be OK," says Jessica. Many people seek closure by conducting small memorial services before their pet is sent into the funeral pyre. Brenda says she has seen as many as 30 mourners gathered to sing songs or say a prayer over the body of their fallen friend. Some, she's noticed, have their own little rituals. One of her clients, for instance, snips off a lock of his hair and lays it in the crematory alongside his pet each time one passes. "They send their baby off in style," Brenda says. The services, which can take many forms, happen more often than one might think, Jessica adds. "It just keeps going back to the fact that they look at [their pet] as their family member, so they're going to send them off the same way you would any loved one," says Jessica. The sentiment rings especially true for Sonya. After her 16-year-old rottweiler lab mix, Abby, passed away last February, Sonya's friends helped her recover from the shock by convincing her to have a bonfire in the dog's memory. Soon, about 20 people had gathered around a fire to play music in tribute to Abby, whom Sonya called a "party girl," and reminisce about how the pooch used to run around at similar social events stealing people's shoes. When fate snatched Sonya's second dog, Kiara, away from her three months later, Sonya held a smaller, more intimate memorial for the 16-year-old Boston terrier, who had been the last descendant of a prize-winning bloodline bred by Sonya's great-grandmother. "The whole family took a hard hit on that one," Sonya says. The 10 family members gathered to comfort each other and look through photos of Kiara, starting with a picture of the tiny terrier lying snug in Sonya's shoe as a puppy, and ending with the picture Sonya took of the dog lying on her chest only moments before Kiara drew her final breath. "I wouldn't say that I'm done grieving, because I'm pretty sure that 45 years from now I could still talk about those two dogs and would still be teary," she confesses. But with the closure she got from the memorials and the urns on her mantel reminding her of cozy nights with Abby and Kiara on the couch, Sonya says she's beginning to heal, even if it still hurts every time she expects to hear the pitter-patter of paws but is met with silence. "I know beyond a shadow of a doubt that in doggy lives, they were happier than anything," Sonya says. "They did what they wanted, and all they ever wanted was to love me. And they did a great job at it." Cats and dogs aren't the only ones getting special treatment postmortem. Faithful Friend Pet Crematory and Funeral Home in Cleveland, Tennessee, offers a special package for "mini pets," such as hamsters, gerbils and small birds, and the staff at Pet Haven has seen owners bring a large variety of critters through their doors. So far, that list includes lizards, iguanas, chickens, pigs and goats, among others. One couple brought in a deer that had drowned in their swimming pool, those at Pet Haven recall, and a few others have brought in squirrels they hit while driving.